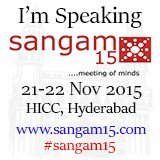 SANGAM15 – See you there! I mentioned my Oracle OpenWorld 2015 trip in a previous post. Yesterday evening I picked up my passport with my lovely new India visa in it!